Antique 1905 Tiffany & Co Sterling Silver Shell & Thread Oval Soup Spoon 7 1/8"
For your consideration is an Antique 1905 Tiffany & Co. .925 Sterling Silver Shell & Thread Pattern Oval Soup Spoon in pre-owned condition. The spoon you will receive will show light to average signs of wear and feature Tiffany & Co.'s patent 1905 Shell & Thread pattern crafted in fine sterling silver with no monogram on the handle. The spoon will measure 7 1/8 inches in length and 1.5 inches in width. Weighs approximately: 58 grams. The photos provided may not be the exact spoon you receive, however it represents the same product. 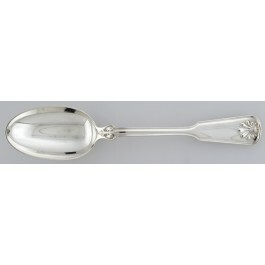 You're reviewing: Antique 1905 Tiffany & Co Sterling Silver Shell & Thread Oval Soup Spoon 7 1/8"